EGS India has been the Authorized India-Wide Reseller for SolidWorks Simulation ( Cosmos FEA ) since 1997. Backed by years of experience in solving product performance issues, EGS India has been successfuly implementing SolidWorks Simulation across a wide variety of applications including automotive, material handling, appliance, process, power, heavy engineering and machinery Industries. 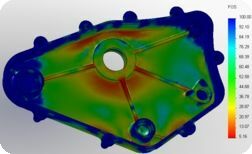 Reputed Manufacturing Enterprises have invested in SolidWorks Simulation for three main reasons - Easy to Use CAD Integrated Solution, Trusted Experience from EGS India and ability to simulate wide ranging problems. Looking to Validate Your Designs Quickly? SolidWorks Simulation empowers Design Engineers working on varied CAD systems, such as Autodesk Inventor, SolidEdge, Unigraphics, Pro/ Engineer, CATIA among others, in addition to SolidWorks, to validate their designs without any barrier. Interoperability with other CAD systems enables SolidWorks to overcome translation issues and provides designers with a framework to cross-check their designs instead of concentrating on the tool. Need an experienced Solution Provider?